Spring hasn’t arrived quite yet, but the spring Greater Mohican Audubon Society newsletter has. Enjoy and, if you’re not already a member, I’d encourage you to join. GMAS is one of the organizations working to help folks enjoy the Mohican area and help preserve it as a special place for future generations. Besides, it doesn’t cost a whole lot. PS: GMAS-sponsored events are open to the public, not just for members only. Did you hear? John Lennon said the Beatles were better than Jesus. That was the buzz after he made his infamous statement during an interview with a London journalist. That wasn’t what he said. * He said the Beatles were more popular than Christianity among English youth. But, after an American teen magazine quoted him out of context and the media ate it up and regurgitated it, John Lennon said the Beatles were better than Jesus. Good thing Fox “News” wasn’t around then. God knows where Rupert Murdoch’s fairly imbalanced spin doctors would have gone with it. Lennon’s statement originally was published on March 4, 1966. At the time, Beatlemania was still in full gear, even in my little world on the West Side of Cleveland. “Ghetto lite” as I called it in my previous post. I was 14 and going to Thomas Jefferson Junior High, the same school I was at in 1964 when the Beatles made their American television debut on the Ed Sullivan Show. Later in 1966, my family moved to a better neighborhood further out on the West Side, near Halloran Park. If that name sounds familiar, that’s the playground where — two months before I was born — 10-year-old Beverly Potts disappeared. She was never found. But, all in all, it was a safer neighborhood than the near West Side, where we lived on a backstreet between two sets of railroad tracks. Not only was I the grandson of a poor white sharecropper (seriously), but I lived on the wrong side of both tracks. After the American news media regurgitated Lennon’s statement, there was a predictable knee-jerk reaction. Some of the more straight-laced kids I knew denounced the Beatles. Most kept buying their records anyway. Or shoplifted them if they didn’t have $3 for an album. Singles sold for around 98¢, so even the poorer kids among us could afford them. The great thing about the Beatles singles was they were two-sided hits. Most single records had a crappy song on the “B side,” which we would listen to maybe once. Guess that’s why they called them singles. 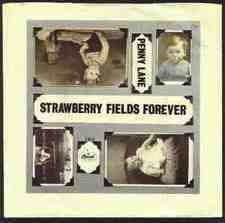 I took “Strawberry Fields Forever” home and played it over and over on my monophonic Sears Silvertone record player. I told her there was nothing wrong with it, that was the way the song was supposed to sound. A question that remains unanswered to this day. Last night, on the 50th anniversary of the Beatles debut on the Ed Sullivan Show, social media sites were flooded with “Where were you then?” posts. For me, and millions of other people, the Beatles prime-time American debut was a WTF moment. 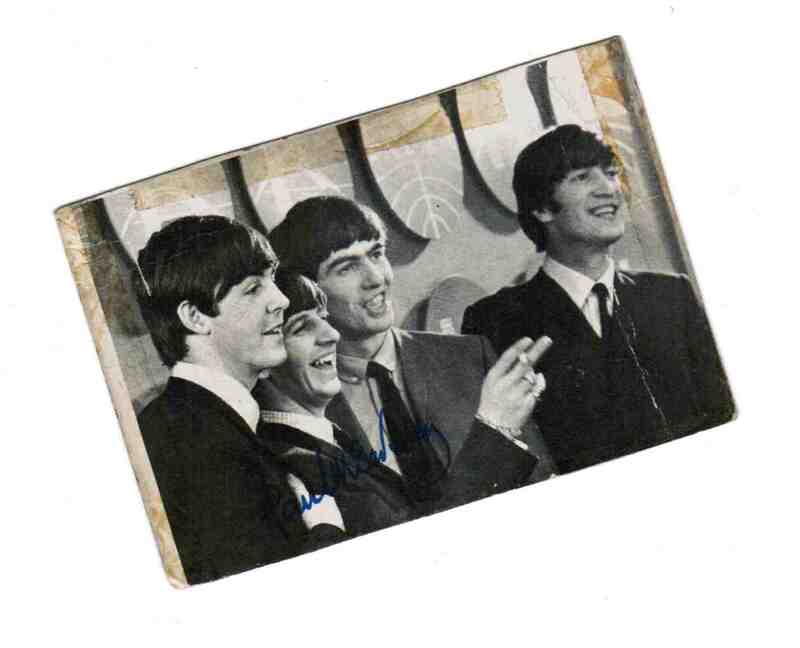 A black-and-white Beatles card, the last remnant of known memorabilia from the Oslin household. I rescued it from the trash after my sister pitched it. The cards came in packs of five with a stick of gum, presumably for sticking the cards to your bedroom wall. Note the yellow stains — probably from where it had be scotch-taped to a mirror on the dresser. “WTF” wasn’t a part of the lexicon then. That would be born of the need for shorthand in an era of electronic communications, something the creators of “The Jetsons” would never have dreamed of. Call it what you will, but it truly was a WTF moment. Four cheeky foreigners mesmerized Americans with love songs that somehow were more than that. Hysterical young women screamed, cried and writhed in their seats. Ed Sullivan, in his routine post-performance banter with the performers, clearly struggled to wrap his mind around this four-headed beast he had loosed on the American public. I was 12. Barely out of elementary school. Awkward. Hopelessly awkward. Vacillating between childhood and adolescence, like a pupa struggling to break out of its murky chrysalis. In my little world, Mad Magazine was cutting edge and “cool” kids were into comic books, horror movies and “The Man From U.N.C.L.E.” TV show. On that Sunday night in the winter of 1964, my older sister and I witnessed this defining moment, beamed into our living room on our black-and-white Philco. I didn’t know quite what to think, but she was impressed with what we had seen and heard. But then, she was 16 months older. Add to that the difference in maturity levels between adolescent females and males and it might as well have been 16 years. What I found really odd was that I could, at least in some small way, identify with her. I got it, at least some of it. We had witnessed something extraordinary, something historical. But how could this be? Surely this couldn’t rank with the assassination of the JFK, which we had witnessed three months earlier on our black-and-white Philco. But, somehow, it had. I felt a bit guilty accepting that, but it was true. Not that I would have admitted it in public. On the Monday after the Ed Sullivan Show aired, I went to school. Thomas Jefferson Junior High on the West Side of Cleveland. Inner-city Cleveland. Our neighborhood was what you might call “ghetto lite.” We didn’t have the daily homicides like they did in Hough — of Hough Riots fame — or in the housing projects that were scattered around the city’s decaying neighborhoods. But we had our share of fights, muggings, stabbings, rats and other vermin. You couldn’t swing a cat without hitting a dive bar — the kind where the sidewalks were littered with broken beer bottles, puddles of vomit and an occasional drunk sleeping it off. We didn’t have to be as street smart as our counterparts in worse parts of town, but we had to learn to lay low, run like hell or, if all else failed, fight. The neighborhood was largely populated by Puerto Ricans and Appalachians who had come to Cleveland looking for work. They replaced many of the neighborhood’s earlier inhabitants, European immigrants and their offspring who had been ambitious and lucky enough to achieve upward mobility and move out to the southwest suburbs. Interstate 71 hadn’t been built yet, so a lot of these comparatively affluent suburbanites took West 41st Street en route to their jobs downtown. The speed limit was 25 mph, but they typically drove twice that — some because they were late for work, others because they were in a hurry to slink through the crappy neighborhood they’d left behind. On the way to school every morning, we had to walk through “Death Valley.” That was a section of West 41st Street between the Penn Central Railroad tracks to the south and the Nickel Plate Railroad tracks to the north. Bridges at either end arched over the railroad tracks, creating man-made hills. It was a one-way street northbound and drivers speeding over the first hill sometimes didn’t see people crossing the street in “Death Valley” until it was too late. Occasionally, they’d pick off a kid crossing the street. Sometimes they were polite enough to stop. On the Monday after the Ed Sullivan Show aired, Thomas Jefferson Junior High School was abuzz with talk of the Beatles. All the girls — and a few brave boys — admitted they liked them. But, the thugs, the boys who dominated the social order, were jealous of the Beatles and dismissed them as sissies. 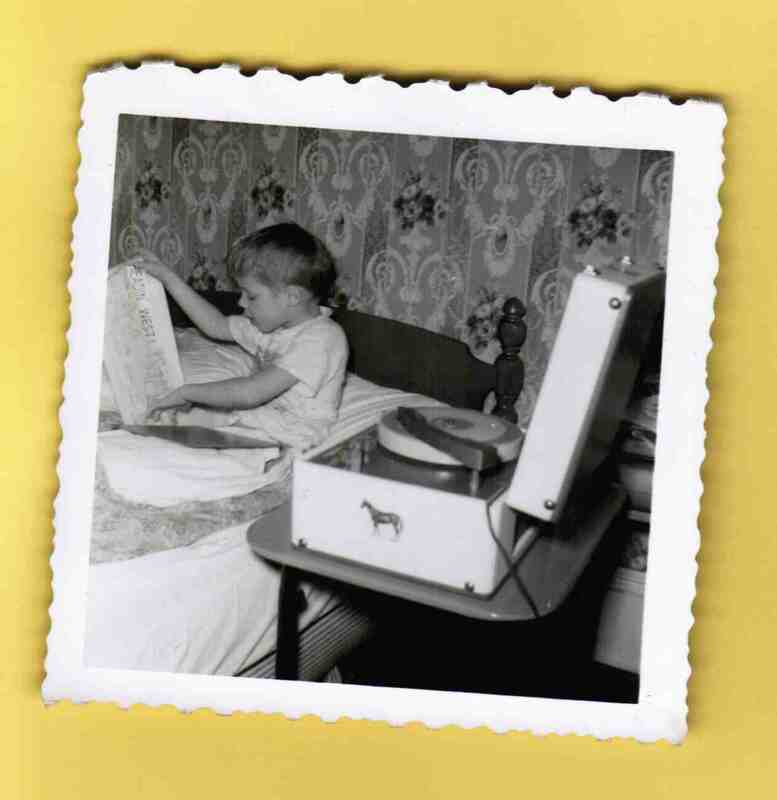 “Coming out” as a Beatles fan was a gutsy choice for a 12-year-old boy in that environment. Especially one trying to emerge from a chrysalis of pubescent dorkhood. For me, and millions of other middle-children born in the baby boom era, the birth order effect also factored into the Beatlemania equation. Our older siblings were more outgoing and adept at social-climbing. We tended to be more introverted and less motivated. In short, we considered ourselves byproducts of society. I recall having to resign myself to not liking the Beatles as much as my older sister did. It wasn’t my place in the birth-order caste system to feel as passionately about things as she might have. A funny aside here. My home room teacher got stuck with all of the middle-born kids in her class. This frustrated the hell out of her because we lacked the school spirit of the older kids at school. I’m sure she envisioned us as a bunch of drooling imbeciles. She didn’t seem to be aware of the birth order effect; they probably didn’t cover that in psychology classes where she went to college. For us, this was a WTF moment, but not in an awe-inspiring sense. We made it abundantly clear that, whatever they were selling, we weren’t buying it. I can’t speak for the rest of my middle-born classmates, but I derived perverse pleasure in this because it pissed off the home room teachers even more. They did little to hide their exasperation. They wrote us off as hopeless and that was fine with me. So, by virtue of my birth order, I was content to be a closeted Beatles fan, to admire them and their music from a safe, socially acceptable distance. Millions of kids experienced the Beatles for the first time in much the same way, seeing them that night on the Ed Sullivan Show. But how you perceived the Beatles depended a lot on who you were. Yet, deep down inside, their influence on young people transcended the dynamics of sibling rivalry and served as a common bond among kids from the inner city and the suburbs — and across international borders. *Just in case you were wondering, here are the lyrics to “The In Crowd,” which was written by a guy named Billy Page. Feel free to sing along or vomit — depending on where you fell in the birth-order dynamic.